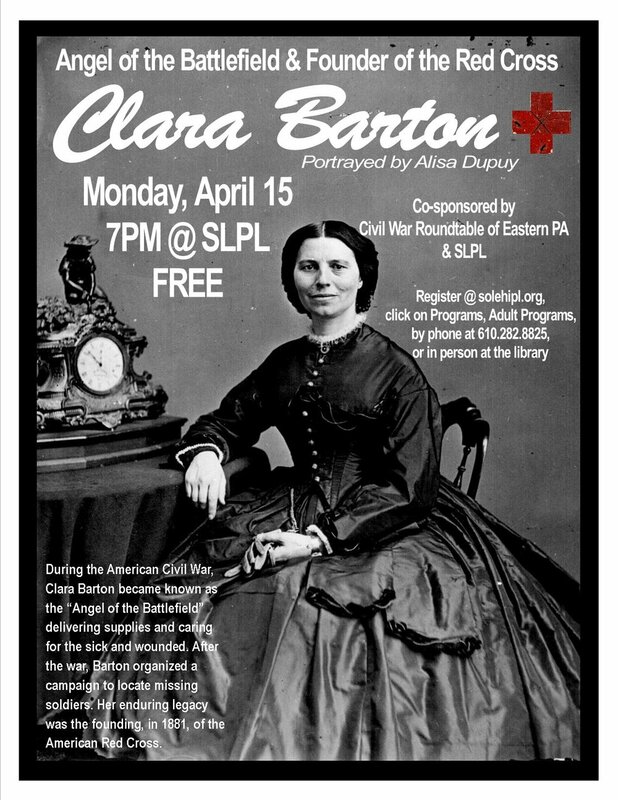 During the American Civil War, Clara Barton became known as the “Angel of the Battlefield” delivering supplies and caring for the sick and wounded. After the war, Barton organized a campaign to locate missing soldiers. Her enduring legacy was the founding, in 1881, of the American Red Cross. What a delightful surprise on March 5th, when we learned as arrived at our Civil War Round Table meeting, that our own Ed Root would be the last minute replacement for Ted Alexander, who was unable to attend. Ed spoke on his 2006 book “Isn’t This Glorious!” which he co-authored with Jeffrey Stocker concerning three Massachusetts Regiments which fought at Gettysburg near the copse of trees. He told the story of the 15th, 19th, and 20th Volunteer Infantry Regiments from that commonwealth, some of their personnel, and their history of following the war and their attempts to place markers at the site of their rush to fill in the gap in the bulging Union line. It was an informative and “glorious” presentation. Thank you, Ed! It is doubtful that any of us had ever heard of Hinsonville, Pennsylvania or her heroes prior to our February meeting. Now, thanks to Dr. Cheryl Gooch, ably complimented by her associate Robert Ford, we know a great deal about these men and their times. One of the wonderful things about our organization is that we all learn something from each presentation. It doesn’t matter if one has studied this period of history for decades or if one is just beginning the journey of discovery, there is always something we each can take away from a meeting. Dr. Gooch gave us something more and that is perspective. None of us can personally truly understand the tragedy of slavery and the quest for freedom and the impact on family for generations. Because of Dr. Gooch’s visit we certainly came away with a better appreciation for the people who endured and triumphed over this evil. It was great to see Brigade Paymaster Jim Duffy and his wife Dee at the February meeting as he continues his recovery from surgery. He looked super and we can’t wait until he’s back full time. I hope you had some fun with my dinner time trivia quiz. I had thought it was somewhat difficult, but Paul Bartlett quickly figured out that the connection between Harriet Tubman, William Seward and Emory Upton was that they all reside in Fort Hill Cemetery in Auburn, NY. Paul was the winner of a booklet of tickets for our June Preservation Raffle. You don’t have to wait to win a quiz to join that worthy effort for the cause of historic preservation. We have some wonderful prizes so check out the table as you enter each meeting. Please don’t make me continue to whine about the few folks who have not renewed membership in our happy band of history students. I know we have a few slackers out there who have not as yet re-enlisted for this Campaign. You know who you are, but if you’ve lost your mind and are unsure please see Jeff Gates at the March meeting. We need and appreciate your continuing support! Bill Frankenfield was kind enough to donate 4 tickets to the combined museums at the Pry House at Antietam, The National Museum of CW Medicine in Frederick, MD & Clara Barton’s Missing Soldiers Office in Washington, DC. These will be raffled off in two different pairs at our April 2nd meeting. You should all be aware that the site of our Gettysburg conservation work on April 27th will be at the John Slyder Farm. No excuses for missing this important work day. There is something for everyone, painting, fencing, brush cutting or just standing around critiquing the work done by others. We’ll have fun, learn about that portion of the battlefield and help preserve and conserve our nation’s historic land! A sign-up sheet will be at the March meeting. Please join us on March 5th as Ted Alexander, a long-time friend of our Round Table, will present Ethnics in the Confederacy. See you on the 5th! The Shenandoah Valley Battlefield Foundation is holding a wonderful conference April 10-13. Because of our generous donation to the SVBF last year they have graciously offered their membership price for the conference to our members rather than the general admission price. This is a $50.00 savings. Send your registration information and payment to Kirsten Kauling and identify yourself as a member of the CWRT of Eastern Pa.
History's Headlines: "The South's last stand"
Getting a monument built to honor Lehigh County veterans of the Civil War wasn’t easy. Wrangling over who was going to pay for it- the county or Allentown- was a sticking point for most of the last half of the 19th century. Then there was where it was to be placed, and would it disrupt trolley traffic. When that was finally settled there was one last question: what day should it be unveiled and dedicated? The Fourth of July or Decoration Day- aka Memorial Day- were batted around as possibilities. Officialdom wanted the summer when chances were best for good weather. But all that was before the veterans were heard from. When they spoke, their message was clear. October 19th was to be the day of the dedication or they would not participate. There was some grumbling from city hall about this but nobody at the time was really surprised. It was on October 19th 1864 that the 47th Regiment of Pennsylvania Volunteers, in which the largest number of Allentown and Lehigh County men had served, participated in the battle of Cedar Creek under General Philip Sheridan, an Irish American cavalry officer born of immigrant parents in Albany, New York who grew up in Somerset, Ohio, and dealt the South a blow from which it never recovered. It was also the day on which most of the local veterans celebrated their annual reunions. So October 19th it was to be. Hindsight, which is always 20/20, makes it seem that by the fall of 1864 most people must have known that a Union victory was assured. But although the South was battered and bruised, no one, from General Grant to the lowliest private in the Army of the Potomac, was willing to make that assumption. The Confederate troops in the Valley were under the command of Gen. Jubal Early. He had been beaten by Sheridan at Third Winchester (also known as the battle of Opequon) and Fisher’s Hill. But as a skilled soldier with veteran troops he knew how to lead them. Their uniforms may have been rags and they had no boots, but they knew how to take orders. For the men in the 47th regiment, being with Sheridan must have offered some satisfaction. Although they had seen more than their share of fighting it had been away from the “real” war in Virginia to take Richmond. It is quite possible some of the Union soldiers were unhappy with Sheridan’s policy of burning out the farms because they found if cruel. But whatever their feelings, they were proud of the role they would play. But there was a price. On October 18th Sheridan was spending the night at Winchester on his way back from a Washington conference with Secretary of War Stanton. Major General Horatio G. Wright was in temporary command of Sheridan’s forces, known as the Army of the Shenandoah. While Sheridan slept Early was on the move. Just before 8 p.m. his troops moved, in single file on what later was called a “pig path.” They had no artillery. By 3:30 am they were in position. Their movement was masked by a heavy fog. “We got in sight of the enemy lines at half past 3 o clock and precisely at five o’ clock…moved in,” wrote Early. Schmidt laments the fact that apparently the only member of the 47th to write about Cedar Creek was a recruit from Sunbury, journalist Henry Wharton. “Wharton’s account would seem to indicate he may not have even present while the 47th was attempting to stem the Confederate onslaught at the beginning of the battle,” Schmidt writes. The best that exists is the official account put out by the state in the regiment’s history following the war. It was at that moment that General Sheridan arrived. Hearing gunfire in Winchester, he had mounted his big horse Rienzi (named after a skirmish in Rienzi, Mississippi, not Richard Wagner’s opera of the same name) and headed south. It was his ride that he made to Cedar Creek that helped rally the troops and turned the retreat into a victory. While Sheridan was undoubtedly a large factor, the Union had a powerful force working for them one that had nothing to do with military tactics. For what really caused the Confederates to stop their advance was the cornucopia of Union largess spread out before them: uniforms, boots and coffee in profusion that these ragged half naked men had not seen for months or even years. Writing to Lee, Early complained bitterly that “even commissioned officers” could not resist them. This was the secret weapon that turned what might have been a major Union defeat into a Confederate debacle. Several months later the Civil War ended. Sheridan went on to take a command fighting Native Americans in the West. Here the hero of Cedar Creek was said to have uttered the words, “the only good Indian is a dead Indian.” He claimed he never said them. Others said he had. Sheridan was also one of the strongest supporters of the creation of Yellowstone National Park, lobbying Congress using all his war hero status to keep out railroads and other developers. He also contributed military relief efforts following the Chicago Fire in 1871. In the Lehigh Valley the veterans of the 47th continued to hold reunions on October 19th till they were no more. Our CWRT made a field trip to the National Civil War Museum in Harrisburg on Saturday January 26. Spearheaded by Claire Kukielka and Barry Arnold, we met at the museum when it opened at 10:00am and received a brief orientation from CEO Wayne Motts and Educator Dane DiFibo. For the next ninety minutes, we were treated to a behind-the-scenes tour of archival material. First seen were some of the museum’s vast collection of Civil War era documents. Examples of items seen were: promotion certificates signed by President Lincoln, telegraphed requests for information from field staff, orders prohibiting the sale of liquor in Gettysburg on June 30, 1865, photos of young soldiers and sailors, envelopes from soldiers on the lines bearing postage stamps from both the union and confederacy, and many more. We then traveled downstairs, and after donning white cotton gloves, we entered the extensive collections area, where the sign on the door reads, “Center of the Universe.” What a fantastic and eclectic collection of Civil War memorabilia. Among the treasures were: a pistol owned by William Quantrell , a spoon from US Grant, a top hat owned by Joshua Chamberlain. a diary with a bullet embedded in it, ceremonial swords, field desks, boot strap pulls, a bloody Bible, a general’s uniforms, and more and more. Following this tour, we ate our lunches together, and then spent the remaining time before a 2:00pm lecture, walking through the public exhibits at the museum, reading histories, looking at artifacts and watching numerous videos. The museum is a gem and does a fine job explaining the causes, battles, and aftermath of the war. Following the lecture, we headed home more enlightened and edified than when we arrived. The photos below are of the museum and its public collections. As stated above, we were requested not to share on social media the pictures from our “behind-the-scenes” tour. The phrase “a picture is worth a thousand words” never rang truer than it did at our January meeting. Much thanks to Chris Heisey for his informative and entertaining presentation. Our country’s battlefields came alive through his wonderful photographs. We were pleased to send a $50.00 donation to the American Battlefield Trust in his name. Battlefield trekking lessons learned from Chris; stay off the railroad tracks at Thoroughfare Gap and beware of sinkholes at Ball’s Bluff. If you don’t know what that means then shame on you for missing a great meeting. At the January meeting I mentioned that we had a complete 28 volume set of the Time Life Civil War Encyclopedia that we wished to donate to a school, library or other facility where they would be appreciated and utilized. I am happy to report that thanks to Tony Major, Legend of Allentown Senior Living has taken the set for placement in its library. Thanks also to Marie Maly and Bob McHugh for investigating possible homes for the set. I know we have a few slackers out there who have not as yet re-enlisted for this Campaign. Please see Jeff Gates at the February meeting or suffer the consequences! Seriously, we need and appreciate your continuing support! You should all be aware that the site of our Gettysburg conservation work on April 27th will be at the John Slyder Farm. No excuses for missing this important work day. There is something for everyone, painting, fencing, brush cutting or just standing around critiquing the work done by others. We’ll have fun, learn about that portion of the battlefield and help preserve and conserve our nation’s historic land! A sign-up sheet will be at the February meeting. Claire and Barry worked long and hard to set up the field trip to Harrisburg’s wonderful Civil War Museum. Those who went on this trip on January 26th were able to view some of the treasures behind the scenes thanks to Wayne Motts. Please let Claire and Barry know how much you appreciate their hard work and dedication on behalf of our organization. Please join us on February 5th when Dr. Cheryl Renee Gooch will present, “Hinsonville’s Heroes” Last August Kay, Kim and I attended the Civil War Round Table Congress in Harrisburg where we met Dr. Gooch. You are in for a real treat! You won’t want to miss this program! See you on the 5th! Heaven, n – A place where the wicked cease from troubling you with talk of their personal affairs, and the good listen with attention while you expound your own.